Located just one mile from downtown Steamboat, Strawberry Park is located within walking or biking distance to the conveniences of town, but it feels like you are miles away from civilization. At the turn of the 19th century this farmland was filled with strawberry and cabbage fields. Since that time, Strawberry Park homesites have been divided into large parcels of 35 acres and more. The sunshine, the space, the views, and the proximity to Buffalo Pass draw residents to this area. With wide open fields and long, winding roads, it is one of the more peaceful places in Routt County. Home to the Lowell Whiteman School, Buffalo Pass recreational area and Strawberry Park Hot Springs. The properties in this area are primarily single family homes on larger parcels or acreage. 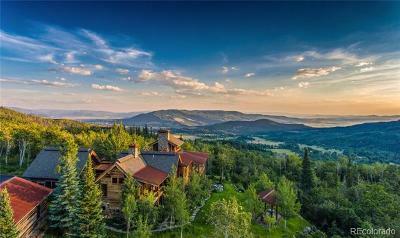 There are several horse properties, homes tucked into the woods, and properties on Buffalo Pass with spectacular views.